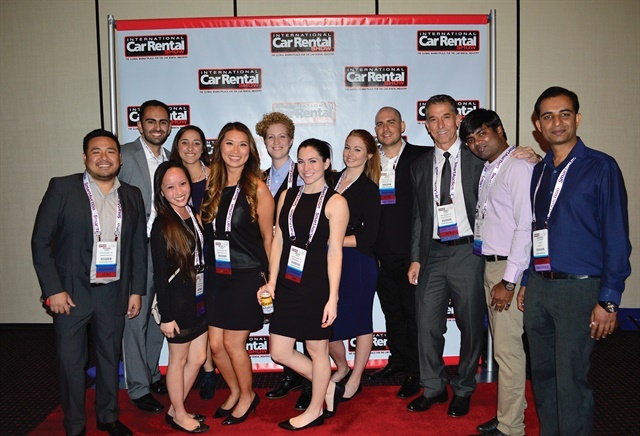 Sure, the 2016 International Car Rental Show (ICRS) — convened April 18 and 19 at Bally’s Hotel and Casino in Las Vegas — was the industry’s usual convocation to make new connections and reconnect with the old ones, share best practices, and understand new products and services. But this year felt different. 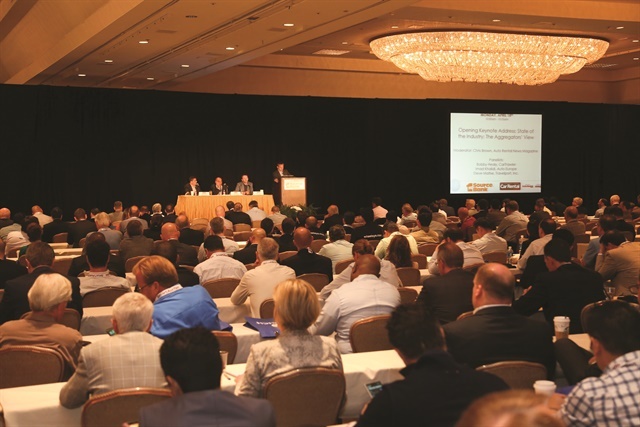 With some big issues on the industry’s plate, ICRS has evolved into an essential forum to hash out those issues and formulate solutions. Attendees traveled from 36 U.S. states and approximately 30 countries, including China, South Korea, New Zealand, Brazil, U.K., and India. 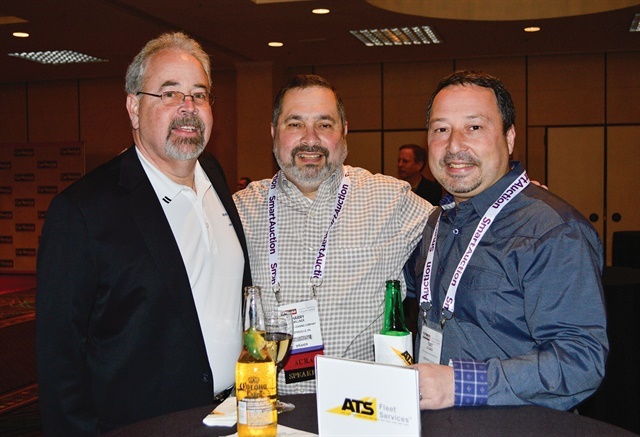 This year’s show included special events for international attendees, including an international meet-and-greet networking session and the first meeting of association directors from around the world. 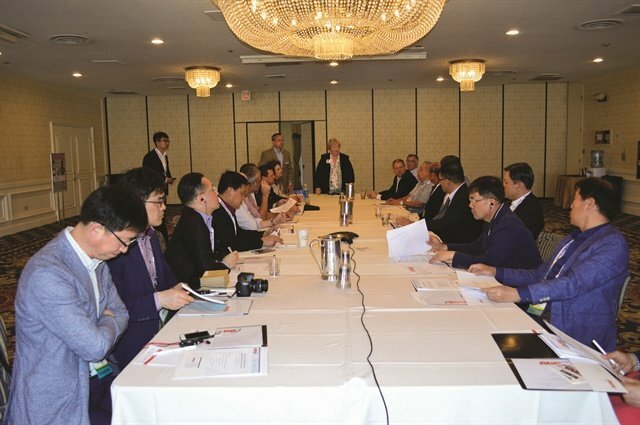 This year featured the first meeting of association directors from around the world, including China, South Korea, Brazil, Mexico, New Zealand, Canada, and the U.S. Photo by Amy Winter-Hercher. The event kicked off on April 17 with an evening cocktail reception, now an ICRS tradition. 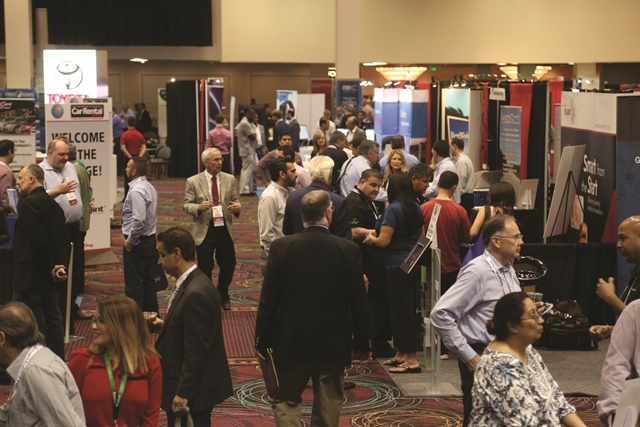 During the two-day event, attendees had several opportunities to spend time in the expanded exhibit hall, which featured exhibitors offering various services and products for the car rental industry. On Monday morning, the show kicked off with a keynote panel of representatives from car rental and travel platforms. Titled “State of the Industry: The Aggregators’ View,” the panel consisted of Imad Khalidi, CEO of Auto Europe; Bobby Healy, chief technology officer of CarTrawler; and Steve Matise, global head of supplier management for Travelport. 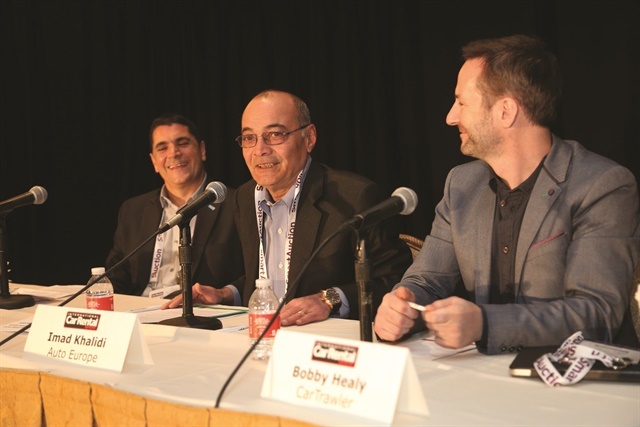 Monday's opening keynote address featured a panel of representatives from car rental and travel platforms (l to r: Steve Matise of Travelport, Imad Khalidi of Auto Europe, and Bobby Healy of CarTrawler). Photo by Steve Reed. The panelists also discussed the relationship between rental car prices and customer service. 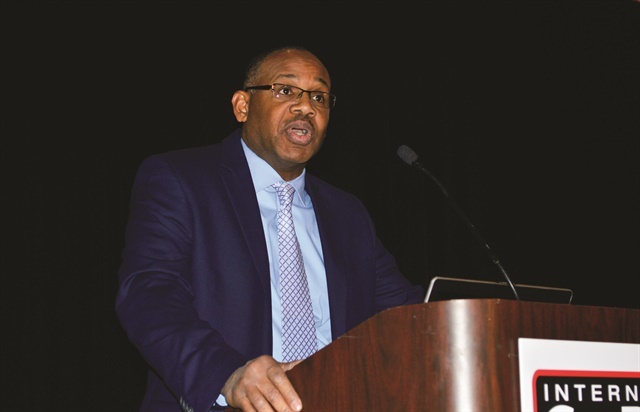 The American Car Rental Association’s general session covered specifics of the new recall legislation that passed as part of the 2015 transportation bill. Additionally, the session featured Bob Kolasky of the Department of Homeland Security, who discussed threats of terrorism and how rental car employees can educate themselves on suspicious activity. 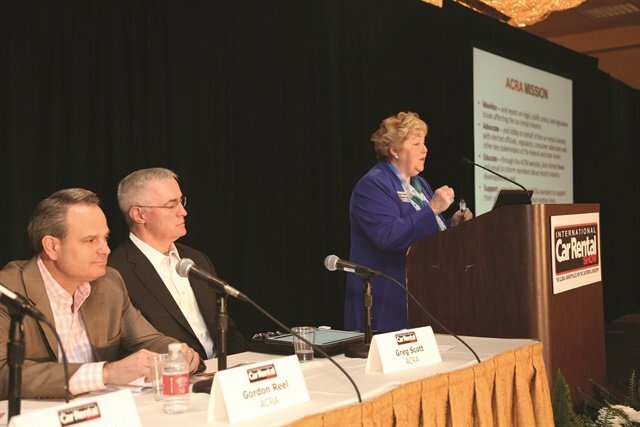 Sharon Faulkner (at podium) and the other members of the American Car Rental Association Board (l to r: Gordon Reel, Greg Scott) addressed the legislative issues facing the car rental industry, including the recent passage of the recall bill. Photo by Steve Reed. During Tuesday’s breakfast seminar, Peter Smith, Enterprise Holdings' vice president of global franchising, discussed the company’s global expansion efforts. Since 2012, Enterprise has expanded its brands to more than 75 countries through franchising, acquisition, and investment. Peter Smith, vice president of global franchising for Enterprise Holdings, discussed Enterprise's ongoing expansion of its three brands: Enterprise Rent-A-Car, Alamo Rent-A-Car, and National Car Rental. Photo by Amy Winter-Hercher. Concurrent sessions featured various topics, including how to grow business-to-business rentals, how to use Graves Amendment to lower liability expense, tips for improving online marketing and phone sales, and how to motivate millennials in the workplace. The seminar, “The Recall Law Is Law — What Now?” dove into how the new law will impact rental car operations. Panelists offered best practices on compliance and operational and customer service challenges. 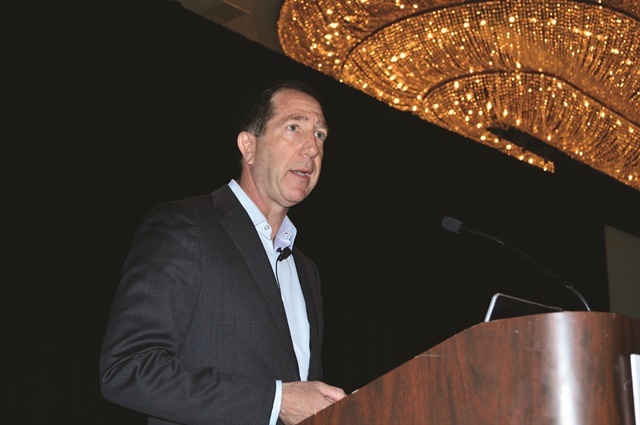 “The biggest burden we have right now is having to open 638 pieces of mail (recall notifications from NHTSA) to find out that 330 of them are for vehicles we no longer own,” said Mike DeLorenzo, executive vice president of International Franchise Systems. Designed for car rental operators serving Central America, South America, and the Caribbean, the third annual Latin American meeting was held on Monday April 18. During the International Meet and Greet, foreign operators had the opportunity to network with other international attendees as well as operators from the U.S. Photo by Steve Reed. It featured seven seminars covering issues facing the Latin American market today, including trends on booking cars through online travel agencies and brokers, how to strengthen standards for the market, maintaining employee engagement, and the investors’ view of the Latin American car rental market. The show also featured a day of programming for another niche audience: auto dealers looking to strengthen their loaner programs. Opening with a view of the loaner market from representatives of four auto manufacturers, seminars covered topics such as tips for managing your rental and loaner business, how to develop a unique brand identity, and insight into the legal questions facing dealer rental programs. The show concluded with a session focused on the future of transportation: connected car technology. Currently, the U.S. Department of Transportation is working with stakeholders to implement this connectivity. Egan Smith of the U.S. Department of Transportation addressed the future of connected car technology and how it could impact the car rental industry. Photo by Amy Winter-Hercher. Egan Smith, managing director of the U.S. Department of Transportation’s Intelligent Transportation Systems Joint Program Office, addressed the impact of the connected car on the car rental industry in the U.S. and globally, as well as government mandates for implementation and pilot deployment programs. A connected vehicle talks to other connected vehicles and advanced roadside infrastructure such as traffic signals as quickly as 10 times per second. The 2017 International Car Rental Show will be held March 27-29 at Bally’s Hotel and Casino. Robert Muhs. Photo by Amy Winter-Hercher. Robert Muhs received the 2016 Russell Bruno Award for outstanding service to the auto rental industry at Tuesday’s closing general session. Muhs serves as vice president, government affairs, corporate compliance, and business ethics for Avis Budget Group and is a member of the American Car Rental Association’s board of directors. After 22 years in the rental car industry, Muhs is considered the “dean” of government relations within the industry. He has played active roles in the passage of the Graves Amendment, the Safe Rental Car Act, and various state initiatives, including allowing the sale of damage waivers in New York. Sharon Faulkner, executive director of the American Car Rental Association (ACRA), presented Muhs with the award. 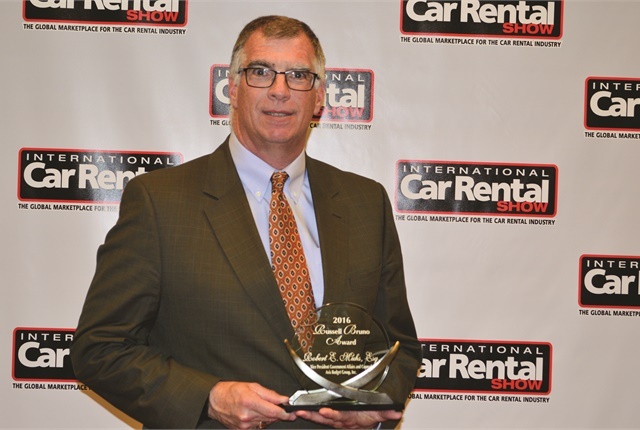 The Russell J. Bruno Award has been given at the Car Rental Show since 2004 and recognizes outstanding service to the auto rental industry. Attendees had several opportunities to interact in the expanded exhibit hall. Photo by Steve Reed. 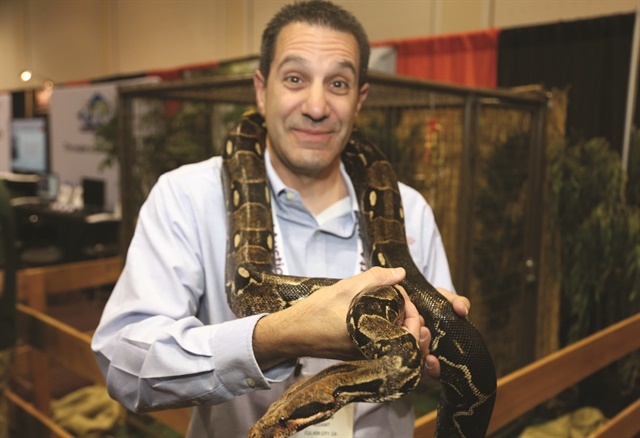 In the booth for PurCo Fleet Services, attendes had the chance to interact with creatures you wouldn't want to find in a rental car. Photo by Steve Reed. 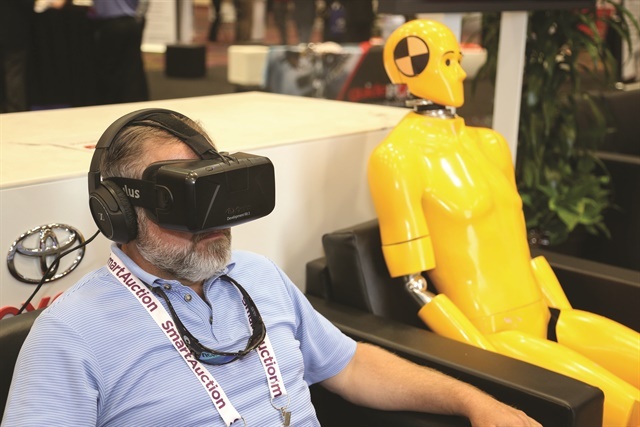 In the exhibit hall, Toyota's booth featured a virtual reality safety demonstration. Photo by Steve Reed. During one of 12 concurrent sessions, panelists (l to r) Doris Morningstar of Hibu, Ian Kusinitz of Empire Rent A Car, and Jon Dill of NextCar, Priceless, and Rent-A-Wreck offered tips to improve a rental agent's phone performance and even rated several recorded calls. Photo by Amy Winter-Hercher. The show featured several opportunities for networking, including a welcome cocktail reception on Sunday night. Photo by Amy Winter-Hercher. The Rate-Highway team poses for photos at the event's backdrop. Photo by Amy Winter-Hercher.